As much as it bugs a lot of people, mobile gaming is massive. You only need to take a look over the shoulders of those on the train as you wander up and down trying to find a seat in rush hour in order to notice how many people spend a lot of their spare time playing PUBG, Fortnite, Real Racing or one of the millions of Candy Crush clones. And they’re not playing this on a PC or console, but on their phone, which despite best efforts isn’t always the most efficient way to play a few games. Why? Well, as a piece of technology they’re up against it really. Small screen, disastrous battery life, astronomical price, poor speakers and internals that struggle to keep up with most new games being released. What you need is a relatively cheap phone with plenty of bang for your buck, a decent screen and a battery that doesn’t splutter and die whenever you dare to use it for 8 minutes at a time. Sound like you? 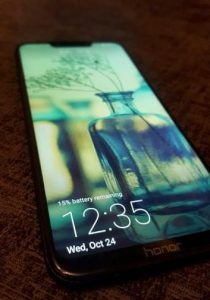 The maybe the Honor Play should float to the top of your list of phones to consider. Currently available until Christmas at a smidge under £250 you can buy three of these for the price of an iPhone with a fair bit of change left over for cake, and considering it plays anything you throw at it while lasting far longer than you’d imagine before calling it a day, you can’t help but wonder how companies charge so much more. It’s not even as if this feels cheap alongside more premium phones. The body feels robust and premium, the screen is fully corner-to-corner and looks gorgeous despite “only” being 1080p, and there’s a satisfying weight to it in your hand, and when placing it alongside my wife’s Samsung S9 there’s not much to choose between the two. There are, admittedly, a couple of corners which have been cut, but as you’ll find out they might not bother you at all. We chucked a lot of games at this phone; you can, after all, get away with installing a lot onto the 64Gb of storage you get here. 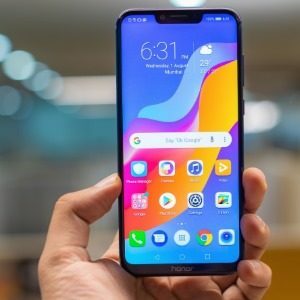 Honor (well, Huawei if you want to be picky) are marketing this as a gaming phone too, so we wanted to make sure it stood up to that test, to see if there was anything on the market that the Honor Play struggled with. We couldn’t find anything. World of Tanks, PUBG Mobile, Real Racing 3, Injustice 2 and Truck Simulator all ticked over superbly without really seeming to trouble the phone, and that’s just a small selection of the games we tested out. It was pretty much on par with the S9, and while the screen possibly isn’t quite as good as the Samsung, the price difference more than makes up for it. The sound is decent too considering there’s only one speaker, giving some decent range despite it’s miniature form. It’s still not amazing for music or films, but with the inclusion of a 3.5mm headphone socket (woo!) you won’t have any issues once you plug your headphones in. Probably just as well too, because the positioning of the speaker isn’t ideal at all if you’re holding the ends of the phone to play a game. On several occasions I wondered why the sound was so quiet, only to realise I was covering the speaker with my hand, and it was tricky sometimes to find a comfortable way to hold it. If you’re doing any serious gaming then you’ll have your headphones plugged in anyway, but it’s something to keep an eye out for. The interface is pretty nice, dodging the issue of customised Android releases by being a very versatile and customisable version of the operating system. The default options leave a bit to be desired, but there are so many ways you can tweak the look and feel of this version of Android Oreo that you’ll have it just the way you like it in no time. There’s a notch, one of those design things that people have assumed is great because Apple did it, but much to my delight (I’m not a fan) you can switch it off, so it blackens the background of the notched area and just displays the time, battery and notifications up there. It’s a really graceful solution, and prevents bright apps or backgrounds from having that bizarre wonky shape at the top of the screen while still utilising the space. Even the soft buttons to switch and close apps, and move back to the previous screen can be tweaked. You can change the order of the buttons (handy, as a Samsung user I’m using to the back button being on the right, which is weird by itself) as well as deciding whether they auto-hide or not, and the out-the-box method of applying all of your apps on the main screens and eschewing the app drawer all together (again, as per the iPhone) can also be reverted back to the tidier option of a few select icons quickly available with everything else tucked away. The camera looks decent on paper and gives some reasonable results, but I’d say this is possibly an area where things have been toned down to save a few quid. There’s a 16MP camera on the back which does a decent enough job in the daytime, but doesn’t perform quite so admirably when it’s darker. It’s not the same tech as Huawei use in their self-branded top end devices and as such the images don’t quite match up, but if you’re not planning on showing them off in a gallery or printing them out as an A1 sized poster you should be OK most of the time. The front camera is also 16Mp, but again wasn’t quite as good as that figure might have you believe. But really, the front camera is going to be for the odd selfie and video calling, so unless you’re planning on making a career out of your face you probably won’t worry too much about any of that. So what’s this phone then, and who’s it for? Well, that’s an easy one. This is a fantastic looking, premium-feel phone that is quicker than any phone at this price tag really ought to be. It’s great for gaming on, the battery lasts longer than many other modern phones I’ve used, and it’s got that increasingly-elusive headphone socket that most companies are sticking two fingers up at. It’s not perfect, but at this price you shouldn’t expect perfection. 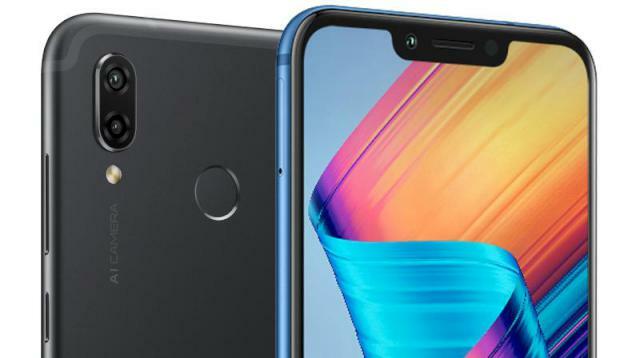 You’ll get higher definition screens elsewhere, better cameras and more pumping audio, but you wo’nt get them for anything less than double the price of the Honor Play. Basically, if you’re in the market for a really smart looking phone that performs well above its wight and won’t break the bank then this should be right up near the top of your list. It’s an awesome bit of kit whether you want to enjoy gaming or not, and should certainly give some of the more high-end manufacturers a few things to think about.